2008 July : Audio Design Labs Inc. Located in the heart of Soho London, Music 4 Studios provide a full range of audio post-production services—5.1 and stereo mixing, sound to picture (High Definition, SD, QuickTime, etc. ), sound design services, voice recording—for some of the biggest names in the business, including the BBC, and a multitude of outstanding independent production companies, advertising and marketing agencies. 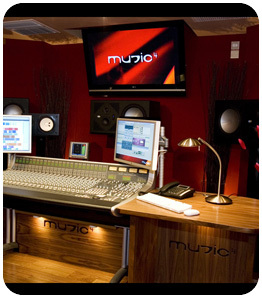 Music 4’s recent expansion from 1 to 3 studios offered the ideal opportunity to upgrade the spec of their original studio. Part of that enhancement included the installation of two Blue Sky Big Blue 5.1 surround systems for Studios 1 & 2, and a Big Blue 2.1 System for Studio 3. When cinematographers Salvador Lleo and wife Dominique Martinez decided to convert a small guest house within their turn-of-the-century Hollywood Hills house into a post-production suite, the goal was to maintain the integrity of the vintage architecture while building a state-of-the-art studio. 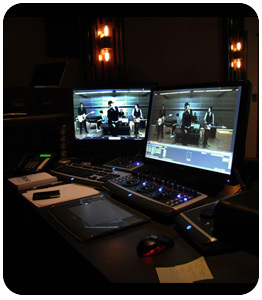 The room would serve as the hub for the couple’s newly launched business, In A Place Productions (IAPP), specializing in color-correction—a critical step in the final film editing process whereby the colorist and Director and/or Director of Photography work together to create a visual look for the project that includes beauty retouching, creating consistency between scenes, and basic clean up. What the couple ended up with was a versatile, state-of-the-art production studio to handle their burgeoning clientele, consisting of independent and commercial film production and music video companies, as well as mega-advertising agencies like Saatchi and Saatchi.